Happy New Year, dear readers! 2014 is now upon us – and it’s almost hard to believe, as 2013 went by like a flash! It was a great year both for the board game community and Dice Hate Me Games, as we added four more titles to the library with successful Kickstarter campaigns for Compounded, VivaJava: The Coffee Game: The Dice Game, Belle of the Ball, and Brew Crafters. With Unpub 4 just around the corner, the Dice Hate Me 54 Card Challenge in full swing, and a few secret projects in the works, this year has the potential to be even greater for games! But first, as is the custom each year around this time on Dice Hate Me, it’s time to look back at some of the best and brightest board games from 2013. The competition was fierce – so much so, in fact, that I’m breaking a little from the norm and listing not only my first, second and third choices, but also an honorable mentions category! Just as a clarification to the process, the Game of the Year Award is open only to those games that were published and distributed openly in the United States in 2013. 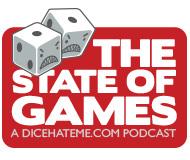 But, just like last year, in order to honor those games that graced the gaming table for the first time this year but were published before 2013, I am continuing to announce the Dice Hate Me Discovery of the Year Award – and that choice was almost as tough as for Game of the Year! So let’s get on with the choices, and happy gaming in 2014! All you dear readers (and listeners) will not be shocked when I say that I just love an underdog – and sitting amongst the hulking, somewhat-overproduced behemoths that populate the rest of my Games of the Year picks, Gravwell can most certainly be defined as “the little board game that could.” When I came across Gravwell at the Cryptozoic Entertainment booth at Gencon, it was just sitting there, completely unassuming, and dwarfed by the myriad licensed properties that have become Cryptozoic’s bread-and-butter. On a whim, I gave a demo a shot; I bought it halfway through the demo and proceeded to put it in front of every gamer that would listen and had a pulse at the convention. The oft-overused term “elegant” is often bandied about in regards to a game that somehow melds ease of play with a mind-bendingly unique take on fairly familiar mechanics. I would argue that Gravwell not only can reclaim the term “elegant” from the depths of the mundane – it just might possibly redefine it. It’s not going to be the biggest hitter on your gaming shelf, but I can guarantee that, true to its theme and title, the gravity of its gameplay will keep it stuck firmly to your game table for many years to come. Gravwell: Escape from the 9th Dimension is a game for 1-4 astronuts, ages 15 and up, by Corey Young for Cryptozoic Entertainment. If Gravwell was the ultimate underdog on my list, then Firefly could only be defined as the heavy hitter that actually delivered. Everything about Firefly – and my experience with it since picking it up at GenCon – is a complete contradiction. First, despite its lengthy game time, it has hit the table more times than another game in my library this year. Second, for a licensed property – all-too-often the death knell for quality in the board game world – it has absolutely no right to be this enjoyable, or so well-done. Third, the theme and game mechanics actually make sense, despite the fact that the Gale Force Nine team has packed just about every gorram reference from the Firefly TV show into the game. Make no mistake, this game is pure, unadulterated Ameritrash with a heaping helping of uber-shiny Firefly geekdom stuffed into every nook and cranny – but no power in the ‘Verse can stop it from succeeding on every level despite that pedigree. Firefly is a game for 1-5 space cowboys, ages 13 and up, from Aaron Dill, John Kovaleski and Sean Sweigart for Gale Force Nine. There are certain personalities in the board game industry that you simply can’t ignore. They are sheer forces of nature that can often translate into some of the most dynamic and satisfying games to grace a table. Most of you know that I feel Richard Launius is one of those people; Peter Hawes has quickly become another. His design for Triassic Terror took me by surprise this spring and may well have secured its place in the second runner-up spot had he not trumped his own game with one that may be a hair better. Most of the somewhat-familiar mechanics in Francis Drake won’t be bending any minds, but like a good recipe, it’s all in how you combine the ingredients. In this case, Peter Hawes has managed to deliver a six-course meal that is downright irresistible. Throw in amazing production value, a board the size of Francis Drake’s ship, cannons, crew, attacks on forts, and a cardboard treasure chest where you store your booty you’ve plundered from the Spaniards? Who could resist such things. You can’t. You shouldn’t. Do it for England. Francis Drake is a game for 3-5 sea dogs, ages 14 and up, from Peter Hawes for Eagle Games. For years and years, I had heard rumblings that Glory to Rome was the bee’s knees, the veritable cat’s pajamas of card game experiences. However, it was uglier than a burnt bowling shoe, so I continued to turn my graphic-snobbery nose up. Then the Black Box hit Kickstarter and I wept openly at its beauty. 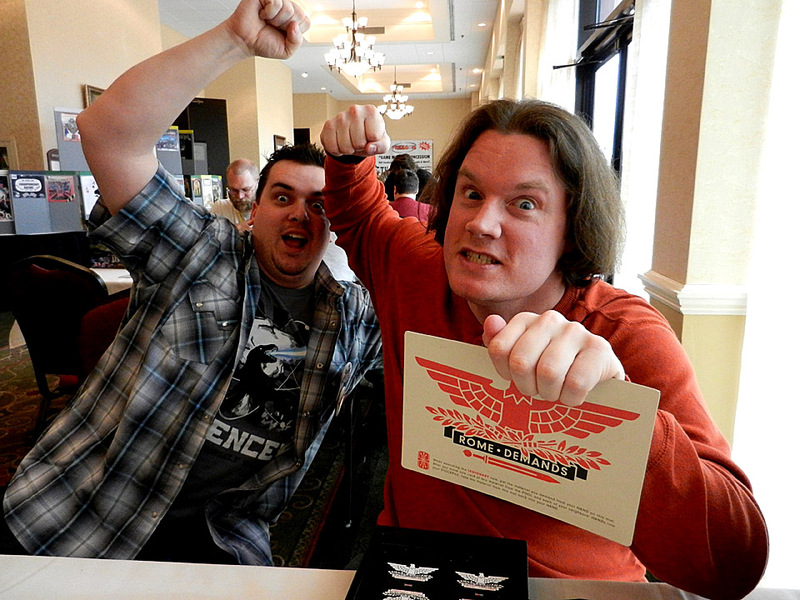 And when TC Petty III finally taught me how to play the game at PrezCon last February, I wept openly at its gameplay. Some of its detractors have chastised the game for being too unpredictable, filled with overpowered combos and points swings that could cause nose bleeds. To them I say: Whatever. The single word that defines Glory to Rome is “ridiculous.” As in ridiculously over-the-top, ridiculously gorgeous, and ridiculously fun. Yes, yes, I cheated and gave a tie for first runner-up. But consider this in my defense: These games are good. Like really, really good. In the case of Downfall of Pompeii, this little reprint of a classic title from Mayfair Games was one of my best purchases from GenCon. With its two-stage gameplay and the satisfying sensation of scooping up your opponents citizens to throw them into an erupting volcano, it’s an irresistible gaming experience. 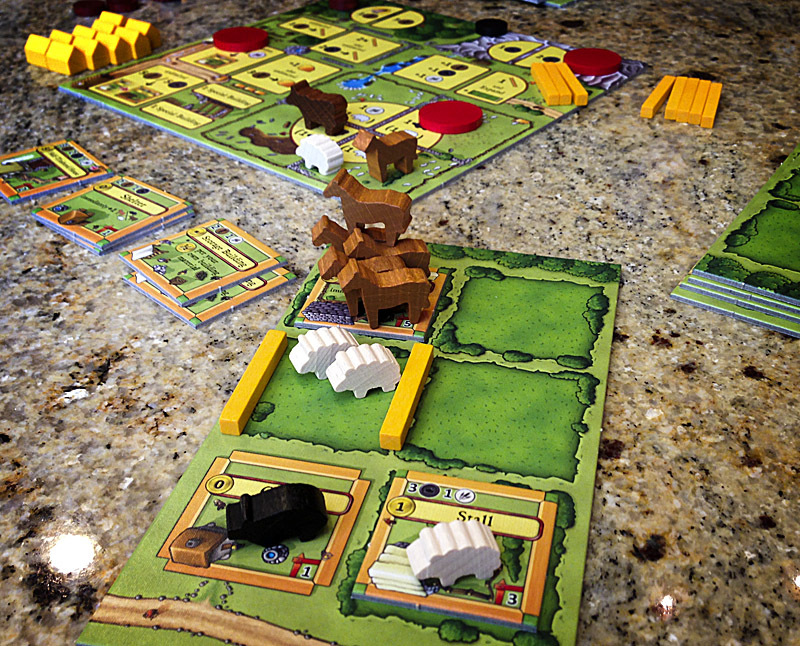 And as for Agricola: All Creatures Big & Small, simply put it’s one of the best two-player games… ever. Without all the pomp & circumstance of having to feed your family or worry about procreating at just the right time, and oodles and oodles of adorable animeeples, it’s ten times better than Agricola. There, I said it. A lot of times it seems as though my mental checklist when considering a title to buy consists of something along the lines of “does this have cars in it? It does! That goes in my checkout basket.” Since 2009, Rallyman had continued to be that elusive, car-filled unicorn that eluded my grasp. To say it was hard to track down without paying an arm and a leg would be an incredible understatement. This summer, though, I cornered that unicorn at GenCon and paid only one arm for it. I’m so glad that I did. 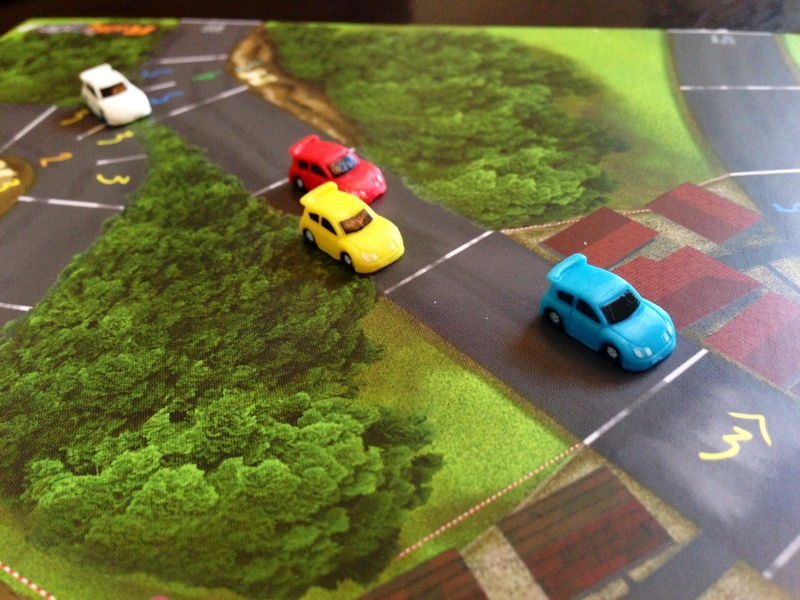 Rallyman combines little plastic rally cars with specialized, press-your-luck dice, and a nigh infinitely-configurable set of game boards. You don’t race against the other players so much as you race against the clock and your own self as you constantly look for little advantages in the curves. It provides twitch gaming without a real-time element or dexterity, and scratches that special gaming itch I get from time to time where I just want to put the hammer down and burn some rubber. Plus, did I mention little plastic rally cars? What’s not to love? I’m sorry, did you just say Knizia? I noticed something similar in the pictures of your GotY and 1st runner up… they look so similar!